Spotlighting the lives of the ‘small and insignificant’ has been wildlife photographer & filmmaker Rod Morris’s raison d’etre for the past few years. And with potential mining operations threatening some of our most significant landscapes, such as the Denniston plateau, he’s been busy shuffling through the under-growth bringing to life the theatre of these vibrant, miniature communities. Last March the author and documentary maker visited the plateau, as part of a Forest & Bird’s Bio-blitz to document the diversity of life on the plateau, and ultimately save it from a 148 hectare coal mine. And just last week, he presented a slideshow of his pictures to the public. Titled ‘Hidden Wealth: Biodiversity on the Denniston Plateau”, the slideshow opened with panoramic pictures of a wind-swept landscape dotted with sandstone pavements and bobular rocks. Over the two day Bioblitz 150 scientists and volunteers scoured this carpet to create an inventory of the species living on the plateau, and potentially discover new ones. All unusual life-forms were swept or delicately plucked from this area, have been put under the microscope, and the list is growing day-by-day as scientists formally identify each species found, and begin the painstaking task of identifying new ones. It seems that life is not only abundant here, it’s very much unique. Its acidic streams are virtually lifeless except for thumb-sized koura (freshwater crayfish) that snack on worms; its vegetation is largely prostrate and its skies are filled with kaka, kea and robins. You may well ask, surely this is DOC’s job to do a full inventory of the life on the plateau, so they’re in a good position to defend it from developments? Not so. Under this pro-mining government DOC has been muzzled from speaking out, or carrying out their duty to protect our biodiversity. The staff members at DOC were on strict orders not to attend the BioBlitz. Situated on the west coast of the upper South island, the Denniston plateau lies 600 – 1000m above sea-level, and is best described as an upland wetland punctuated by pockets of forested refugia. Each year the plateau receives 6 metres of rainfall, and Rod believes these saturated soils make the area inhospitable to predators, which allows the invertebrate, avian & reptilan life to thrive. It appears to be a refuge for our Great spotted kiwi whose population has suffered a 43% decline in population in the past 45 years. But it’s not just our birds that benefit from this virtually pest-free mainland island. Pull away the wind-shorn manuka, or bonsai rata, and you’ll find thriving communities of rare skinks, ancient velvet-worms and giant snails. During the talk, Rod gave us the low-down on the reproductive life of one of its most fascinating creatures – Powelliphanta Patrickensis. This carnivorous snail lays shelled eggs which take eight months to hatch, and in the last month, you can see the baby snail slowly rasping away at it’s first meal: the shell. And take the humble earthworm for example – a creature that is the very basis of life on the plateau. Twenty species live there, some of which are the length of your forearm! From rocky outcrops reminiscent of a Lord of the Rings set to colonies of weta roosting with geckos and giant leaf-vein slugs, the Denniston Plateau is truly special. It contains a number of species that have adapted to this specific micro-niche over millennia – to casually destroy this biological wealth is unforgivable. Relocation of these species is not possible, as we’ve learnt from the attempts to relocate species from our nearby Stockton mine. And rehabilitation of the land is a joke. The coal lies 80 metres deep, so the mining company Bathurst will have to shear off the top of the plateau by using some serious earth-shattering ground works. Replacing that ground-cover like an insta-lawn is seriously just laughable. The sight of the ‘rehabilitated’ (read: weed filled) area of the Stockton mine drove home Rod’s point. Somewhat scarily, it looks like the mining company Bathurst has grand ambitions for this plant. Its coal processing plant is large enough to process ten times the amount of coal it has applied for under its resource consent application. 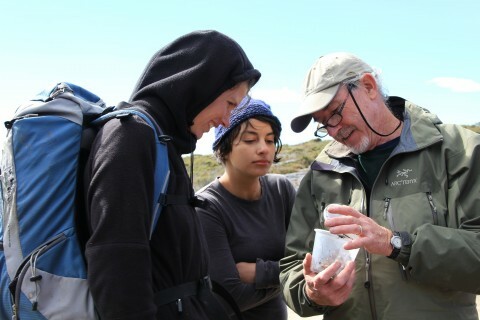 As he wrapped up, Rod listed all the places that conservationists have saved, and placed under protection when these areas were threatened by forestry or mining interests – Poor Knights Islands, Pureora & Whirinaki . For decades, successive governments have downplayed Denniston’s ecological importance because of the coal reserves underneath, despite successive surveys in the 1980s & 1990s that deemed the landscape to be of ‘high ecological value’. Now it’s our chance to speak up. If we shout loud enough about the importance of this ‘Persian carpet of biodiversity,’ we may just have a chance of not only stopping a coal mine, but going a step further by placing this area under permanent protection through a 5900 hectare reserve. So let’s hear it for Denniston’s lowlife!